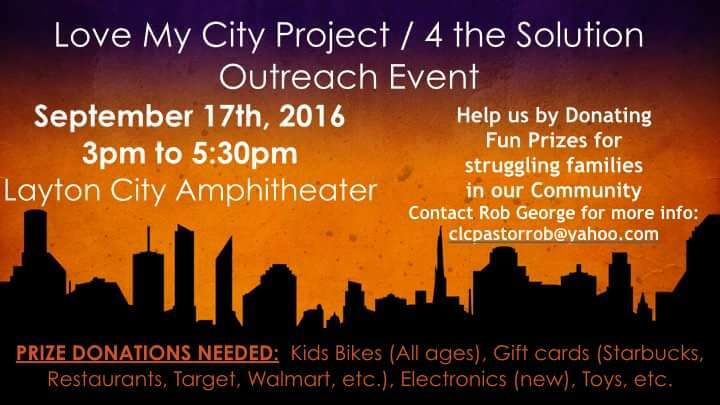 On September 17th – Love My City Project and 4 the Solution are partnering to put on an event to bring awareness and help families in Northern Utah. We are trying to bless these struggling families and have many things planned. One area we are struggling on is Prize Donations and WE NEED YOUR HELP. 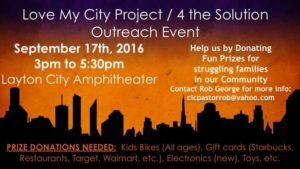 If you could help us collect at least 30 prizes (Bikes, gift cards, toys, etc.) this would be a major blessing. Get in touch with me directly through Facebook or email me (Pastor Rob George) at clcpastorrob@yahoo.com . I know its short notice, but any help would be greatly appreciated as we reach out and give hope to families in need.